SANTA CLARA – Reducing drag in the pool is paramount for swimming improvement, as drag is the biggest deterrent of swimming speed. However, long periods of poor posture out of the water will force any swimmer into poor posturing in the pool, especially during fatigue. If you take a look at a group of swimmers, you’ll certainly see many hunched over with rounded shoulders in the stereotyped “swimmers posture.” This posture has the cervical spine slightly extended, the upper thoracic spine in flexion, the lower thoracic straight, the lumber straight (flexed) and the pelvis tilted backwards. Not only does this poor posturing increase the risk of swimmer’s shoulder, but impairs body alignment and increases drag. Whether I’m with a personal trainer, physical therapist or entire swim team, I’m frequently correcting poor resting posture. The normal lumbar spine (lower back) has a slightly extended inward curve, called lordosis. In individuals with the flat back posture, the pelvis is tilted toward the rear and the lumber has lost this lordosis, causing it to be flat, which is actually a flexed position for this portion of the spine. 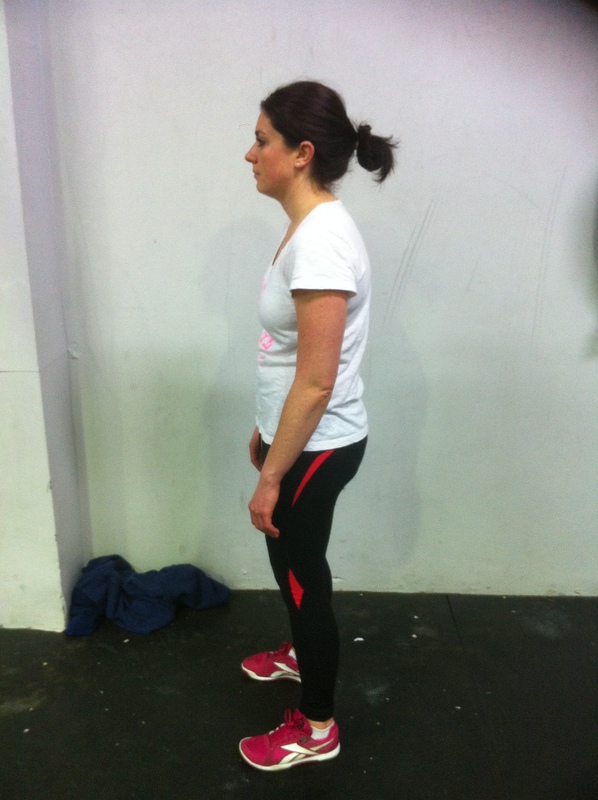 People with flat back will tend to stand with their hip and knees hyper-extended and their head forward. This deviation from ideal spinal alignment is marked by and sometimes called posterior pelvic tilt. This describes the backwards rotation of the superior iliac spine (ASIS) in relation to the pubic bones of the pelvis. A good visualization of this is thinking of the “top” of the pelvis tilting toward the rear. Some of you may think poor posture isn’t a big deal and wonder why swimmers should fix this. There are a couple of reasons. Rounded shoulders and a flat back limit overall spinal motion, a necessary motion during swimming. This poor positioning also puts you into a bigger risk for injury, including shoulder impingement and herniated discs. How do you go about fixing this? Understanding the tight and weak muscles are key. This ultimate guide for swimmers’ posture breaks down strengthening and soft tissue exercises for fixing your poor posture. 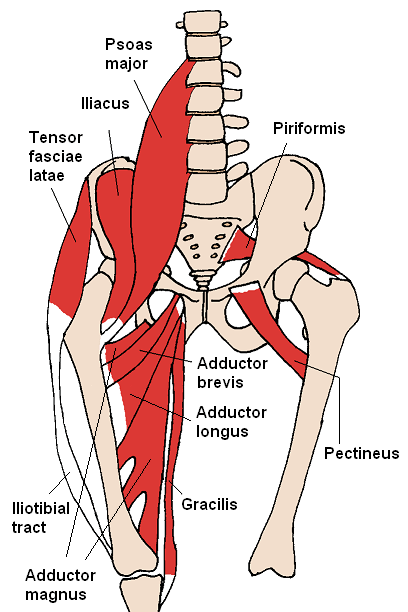 The most commonly tight muscles are the hip flexors, rectus abdominis, glutes, hamstrings, pectoralis, and suboccipitals. One very important side note about the hamstrings – they lie between the glutes (pelvis) and the calves. It’s a tug of war between the glutes and the calves, and the hamstring is the rope. It’s not the rope’s fault that it’s stretched out, it’s the pullers. Most people feel like they have tight hamstrings and stretch them. While it is an OK thing to do, most of the time it’s not going to work because tight hamstrings are a symptom, and not a cause. It’s like getting headaches and popping Advil every day, instead of finding the root cause of the headache. Here is a breakdown to improve your rounded and flat back posture! Time to break down the body parts from the head to the low back. The chin tuck exercise can be done numerous times throughout the day, such as while sitting in the car or at the desk at work. The repetition of this exercise throughout the day also helps develop good postural habits. It is especially important to perform this exercise when the neck and shoulder blades first begin to hurt. Lie on your back with your knees bent. Next, create as many double chins as possible at your neck, without lifting your head off the ground. Next, lift your head slightly off the ground, while maintaining the double chins. The scalenes and suboccipitals are often overactive during poor posture. 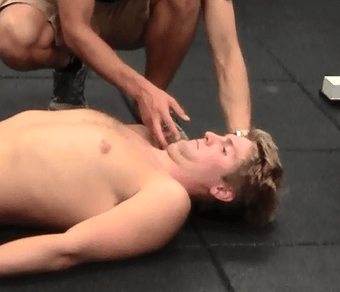 Perform these self myofascial releases (SMR) and reduce tension in the neck. While sitting, gently use your index, middle, and ring finger as you apply pressure to the side of the neck. Make sure you study the position of these muscles first! Lie on your back with your knees bent, then place a tennis ball right next to the bump on the back of your scull. Next, press your head into the ball gradually. For the neck and shoulders, reprogramming the neural system is key and often underdiscussed. If you are looking for some soft-tissue and strengthening techniques, I’ve written about them in detail in the return to swimming protocol; for USA Swimming; and Understanding the difference between shoulder pain and injury. Instead of repeating my work, here is another technique to be used in combination of the other exercises. This is a set of arm movements for mobilizing the brachial plexus, the nerves which run through the arms. This set of mobilization helps restore motion in the nerves, reducing neurosensitivity and arm carrying position (shoulders rounded, etc.). In combination of this, it helps strengthen the back muscles and neck muscles, which are the result of swimmers’ posture. Lie on your back with your knees bent and place a foam roll parallel to your spine. Make sure your head and tailbone are on the foam roll and your head is relaxed. Place your arms on the ground for support and roll back and forth at your desired speed and amplitude. Lie on your back with your legs on a bench or leg rest (elevated approximately 45 degrees). Next, with one end of a mobility stick perpendicular to your body, press into the muscle. You can flex your hip to see if the stick moves, but once in the correct position, hold. Lie on your back, approximately 30 degrees from vertical with the tennis ball on your side between your rib cage and pelvis. Sit with one leg straight and the other bent. Put the tennis ball on the outside of your glute of the straight leg and roll the tennis ball on the outside of your hip. Lie on your side with a tennis ball under your lower thigh, on the bottom leg just above your knee. Bend the top leg’s knee and place it flat in front of the bottom leg. Push through your top leg and forearms to move the tennis ball down the length of the lower leg. Warming up before a workout is crucial. It’s also a good time to make sure that you’re lengthening and activating your dormant muscles. I’ve written more extensively about it here. Before training, consider adding your these exercises before your in-water dynamic warm-up. Also, a proper strength and conditioning program can help improve your poor swimmers posture, so ensure your dryland for swimmers is a well-balanced program, addressing your needs! Also, if you are looking for some free tips on improving your swimming, click here. Have to say it but Phelp’s is waaay bad! Tea nova vježba;) normal movement=helpful movement! !stiže wUP..
You are so right that many swimmers (not all, but many) have very bad posture. It is a big misconception that this poor posture helps swimmers be faster in the water. Many point to Michael Phelps as an example: he is/was the fastest swimmer in the world and has very bad posture so his posture must be helping him swim faster. While he is/was the fastest swimmer in the world and does have very bad posture this does not mean his posture is helping him swim faster and I actually believe it’s making him slower and as you said, prone to injuries especially shoulder injuries. Swimmers posture and cyclists posture are very similar in look because neither sport put vertical load through our major load joints (ankles, knees, hips, shoulders) which causes all the muscles responsible for maintaining joint alignment and posture to get lazy and weak. The problem with most dryland work swimmers do, is that they are doing it with the same terrible posture described above which is just strengthening the bad posture resulting in the strong muscles getting stronger and the weak muscles getting even weaker. The key is to restore proper joint alignment and then teach the body how to load itself vertically in gravity and stabilize itself as an integrated unit. If swimmers took the time to do this they would see their posture improve, injuries disappear, and maybe even their times getting faster. And best of all they would save themselves lots of pain that is headed their way later in life from the cumulative stress of the poor posture like spinal disc herniations, migraine headaches, rotator cuff tears and impingements, and SI joint problems and pain. We have developed a wearable solution for this problem. Using elastic resistance to shift this alignment of the spine and to build strength into the new position. Best worn while going for a morning walk the posturetransformer is the best solution, the most comfortable solution and the most effective solution – especially if you wish to build strength.